Objects are often manufactured in a series of sizes of increasing magnitude. The manufacturer must decide what those sizes should be. An example of such a series is one often used for money and packaging: 1, 2, 5, 10. The appeal of the series is its relation to decimalized currency; all the numbers divide evenly into ten. There is no three or thirty dollar bill. In selecting the numbers for a series, people like numbers easily expressed in words; whole numbers for example. Formerly there was also a strong preference that the highest number in a series have a lot of prime factors, as 12 or 60 do, but the spread of numeracy and especially electronics have diluted this preference. Decimals have won out. Before the 20th century, many series of sizes proceeded by doubling, but the original, 18th century rules for the use of the metric system did not permit common fractions to be used with its units, though everyone does it (half a kilo, for example, is universal). People also expect the difference between adjacent sizes to be constant. For this reason, if a series of sizes must cover a vast range, people are likely to want adjacent sizes to differ by a constant factor, making a geometrical or exponential series, such as 3, 6, 12. The alternative is a series in which adjacent numbers differ by a constant amount (an arithmetic series, such as 3, 5, 7). Shoe sizes, for example, are an arithmetic series in all cultures simply because feet vary only over a small range. If the first size is 10, a geometrical series can reach 100 in 5 steps by making adjacent sizes differ by a factor of , that is, multiply the preceding size by about 1.58. If the first size is 10, an arithmetical series can reach 100 in 5 steps by making adjacent sizes differ by 18, that is, add 18 to the preceding size. An arithmetical series of sizes results in small sizes that are too far apart, and big sizes that are too close together. 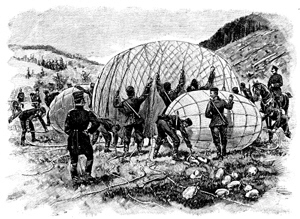 In 1877 a French military engineer, Col. Charles Renard (1849–1905) was given the job of improving captive balloons. (In those days armies used such balloons to observe the enemies' position.) He discovered that 425 different sizes of cable were being used to moor the balloons, a logistical nightmare, and set about determining how best to reduce these to a smaller number of sizes. which cinematographers will recognize as the old sequence of lens focal lengths for 16mm motion picture cameras. In the series “tablespoon, fluid ounce, quarter-cup, gill, cup, pint, quart, pottle, gallon,” the ratio between adjacent terms is 2, which was by far the most common ratio before the rise of decimal calculation. R5: 10, 16, 25, 40, 63, 100. R10: 10, 12.5, 16, 20, 25, 31.5, 40, 50, 63, 80, 100. R20: 10, 11.2 12.5, 14, 16, 18, 20, 22.4, 25, 28, 31.5, 35.5, 40, 45, 50, 56, 63, 71, 80, 90, 100. R40: 10, 10.6, 11.2, 11.8, 12.5, 13.2, 14, 15, 16, 17, 18, 19, 20, 21.2, 22.4, 23.6, 25, 26.5, 28, 30, 31.5, 33.5, 35.5, 37.5, 40, 42.5, 45, 47.5, 50, 53, 56, 60, 63, 67, 71, 75, 80, 85, 90, 95, 100. It also defined an exceptional R80 series, with 81 values, which is little used. Rounded series are also defined; they are indicated by a prime mark following the R.
R′10: 10, 12.5, 16, 20, 25, 32, 40, 50, 63, 80, 100. R′20: 10, 11, 12.5, 14, 16, 18, 20, 22, 25, 28, 32,36, 40, 45, 50, 56, 63, 71, 80, 90, 100. R′40:10, 10.5, 11, 12, 12.5, 13, 14, 15, 16, 17, 18, 19, 20, 21, 22, 24, 25, 26, 28, 30, 32, 34, 36, 38, 40, 42, 45, 48, 50, 53, 56, 60, 63, 67, 71, 75, 80, 85, 90, 95, 100. R″5: 10, 15, 25, 40, 60, 100. R″10:10, 12, 15, 20, 25, 30, 40, 50, 60, 80, 100. R″20:10, 11, 12, 14, 16, 18, 20, 22, 25, 28, 30, 35, 40, 45, 50, 50, 55, 60, 70, 80, 90, 100. Sometimes a series of sizes may be chosen by taking every other value in a series, or every third, or fourth, or so on. In the designation of such a selection the size of the skip is shown by a number after a slash. “R5/3,” for example, means a series consisting of every third value in the R5 series. Such a designation must include at least one end of the series. For example, R5/2 (10...400) would mean the series 10, 25, 63, 160, 400. ISO 3-1973, Preferred Numbers – Series of Preferred Numbers. ISO 17-1973, Guide to the Use of Preferred Numbers and of Series of Preferred Numbers. ISO 497-1973, Guide to the Choice of Series of Preferred Numbers and of Series Containing More Rounded Values of Preferred Numbers. ANSI Z17.1-1973, American National Standard for Preferred Numbers. C. F. Hirshfeld and C. H. Berry. Size standardization by preferred numbers. Mechanical Engineering, vol. 44, no. 12 (Dec. 1922), page 791. Last revised: 10 June 2014.